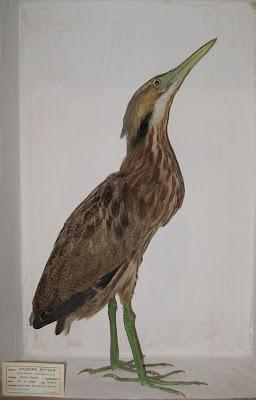 I first came across the American Bittern specimen whilst auditing the natural history collection at the art gallery and museum in October 2010, prior to it being packed up for storage. Subsequently, I have been given the chance to plan displays for two cases in the new Collectors Gallery when the art gallery and museum re-open in 2013. 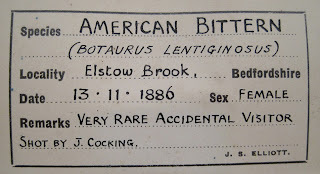 I knew I would like to display the American Bittern and wanted to learn more about it. The ‘Mr Covington’ referred to is Arthur Silas Covington (1847-1915), who was a taxidermist operating a business in Bedford. 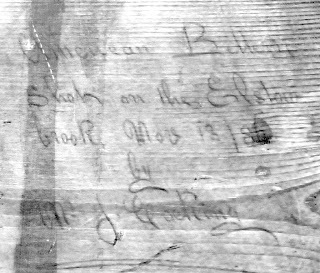 He was born and died in Bedford and during his lifetime had workshops in St Paul’s Square, Lurke Street, and Foster Hill Road. His occupation on the 1871 census for St Paul’s Square is actually given as ‘Birdstuffer’! In later census’ he is listed as a taxidermist and naturalist but also as a hairdresser. 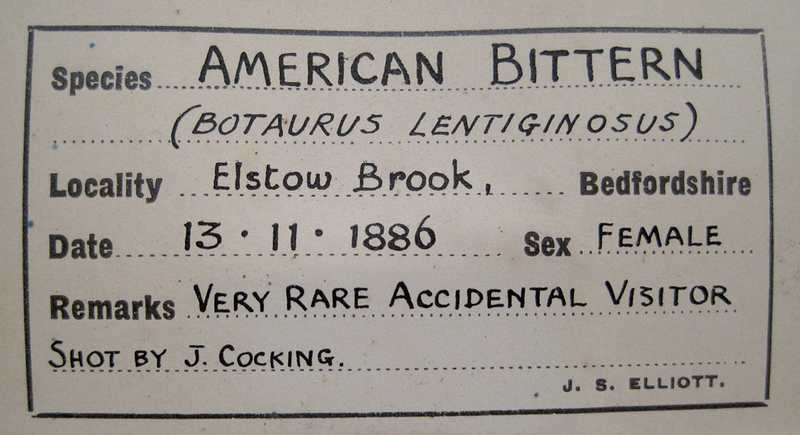 Getting back to the American Bittern, the species was first described in 1813 by Colonel George Montagu (1753-1815) from the first British record. Montagu was regarded as one of Britain’s great naturalists and a number of species are named after him.The Bittern was collected near the River Frome, Puddletown in Dorset in the autumn of 1804. 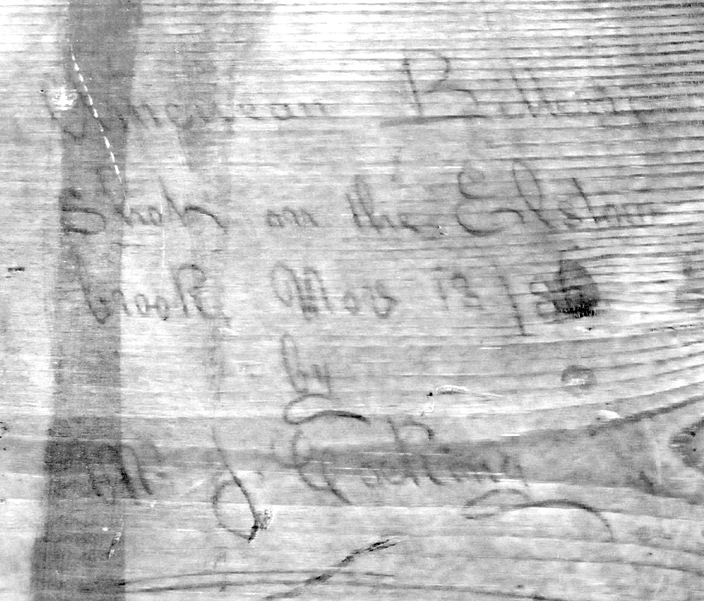 It was shot by Mr Cunningham who sent the corpse to Colonel George of Penryn, Cornwall. Described initially as a Great Bittern (Botarus stellaris) it was then mounted as a Little Bittern (Ixobrychus minutus). The specimen was later purchased as a Little Bittern by Montagu who was apparently quite taken aback when it arrived as it was not what he expected and he subsequently described it as a new species, naming it Freckled Heron. Currently the American Bittern breeds across much of North America and winters in the southern United States, Central America and the West Indies. It is a rare migrant to the British Isles and according to Philip Palmer in his book First for Britain and Ireland “American Bittern was presumed to reach Europe by resting on the surface of the sea using outstretched wings!” There have been about 65 American Bitterns recorded in Britain, with the majority occurring prior to 1960. The most recent was recorded at Walmsley Sanctuary, near Wadebridge, Cornwall in 2010. It is a wetland specialist but numbers have seriously declined since the 1960s due to habitat loss and degradation of sites particularly in the United States, which would explain perhaps why very few have turned up in Britain in recent decades. The species is on the International Union for Conservation of Nature Red List as a species of Least Concern. The American Bittern male has a very unusual call, which I have been privileged to hear in the wild, and this call has given rise to various local names including ‘Bogbumper’, ‘Thunder Pump’, and ‘Stake-driver’. Click this link to listen and enjoy! This YouTube link has some nice footage of an American Bittern and is informative too. Volunteer at The Higgins, working with the Natural History collection.